We here at Cockapoo Crazy know how much you love your pets. We love our little furball as much as any family member, and would do anything to make sure he is okay and well taken care of. We realize that when people experience an emergency situation with their dog they may not think straight. Fear can cause us to make poor decisions. We want you to know how to care for your dog in an emergency, have the supplies on hand to do so, and recognize when it is important to get medical help for the dog. First, the number one thing we MUST stress here is that we are not veterinarians and have no formal medical training. 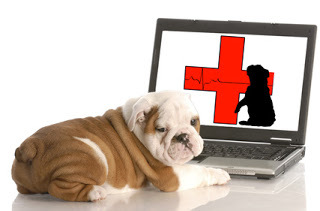 We can not test for and diagnose ailments or prescribe any treatments for your dog. Anytime you think your dog is sick or in danger, you should contact a professional veterinarian for advice and treatment. Know the animal poison control number and the local emergency vet number for your area. Program them into your phone. Write them down in case you are without power. That said, you are your dog’s first line of defense if he is injured or ill. You should know most of the signs of sickness or injury and recognize when your dog needs treatment. Create a first aid kit for your dog, using the guidelines here. We advise you to keep it separate from your household first aid kit. Here are the most important items to keep on hand. You may want to put them all together in a small backpack, seal-able plastic bag, or other container, for traveling. 1) Clean gauze and bandaging tape (both self-stick and non-stick), to dress wounds. 2) Sterile saline solution to wash eyes or flush out wounds. 3) Benadryl or its generic equivalent (diphenhydramine) for allergic reaction. 4) Tweezers for removing splinters and foreign objects. 5) Wound ointment or triple antibiotic cream for injuries. 6) Small scissors to cut bandages or trim hair around injuries. 7) Latex gloves, to keep hands clean and wounds sanitary. 8) A thermometer and water based lubricant. 9) Betadine for wound cleaning and sanitation. 10) A razor to shave areas if needed. 11) Some styptic powder for small cuts or torn toenails, to stop the bleeding. 12) A dog nail trimmer, for nails that have become stuck in or stuck to something. 13) Towels or washcloths, for multiple purposes. A blanket can be a good idea, in case your dog is cold, needs to be transported gently, or needs something to be placed on as you head to the doctor’s office. Optional: You may also want to keep a small quantity of 3% hydrogen peroxide on hand in the kit, because the vet or animal poison control might (in rare cases) instruct you to induce vomiting in your dog. NEVER induce vomiting without instruction from a professional, as you may only worsen things for your dog. Likewise, never substitute your own judgment for that of a qualified animal care specialist! This kit will give you peace of mind and help you deal with small issues as they arise, help you identify problems, and help you take care of your dog (according to the instructions you receive from a qualified veterinarian) until you can get her to the clinic for professional treatment.